I’ve known for quite some time now that my use of semicolons is flawed, at best. So, whilst at the Harry Ransom Center, I’m fortunate to be able to read Sally F. Wallace’s Practically Painless English. 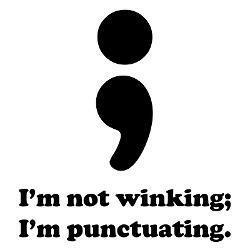 I am determined to go forth and use semicolons in the manner in which they are intended. Semicolons are nothing to be afraid of; in fact, they are most useful. This entry was posted on Thursday, March 19th, 2015 at 7:17 pm	and tagged with David Foster Wallace Archive, punctuation, semicolons and posted in David Foster Wallace archive, Writing. You can follow any responses to this entry through the RSS 2.0 feed.